It's not really a cookie unless it's made with anise, so let's start there. This is close to the recipe that came with my original iron (which has long since burned out), except for using oil in place of butter. I found the oil version on the Villaware web site back when they made pizzelle irons. My current iron is from Palmer. Virginia Dare makes anise oil. Two teaspoons is a LOT of anise oil. You may want to cut back when serving non-Italians. Plug in pizzelle iron. Grease and heat according to manufacturer's instructions. Beat eggs. Beat in sugar. Add oil and anise. Mix baking powder in with the flour and gradually add it all to the dough. Bake in a pizzelle iron 30 seconds each or until the steam stops. If dough squeezes out the sides of the iron, you've used too much. Be sure to scrape it off (because it doesn't get cooked). 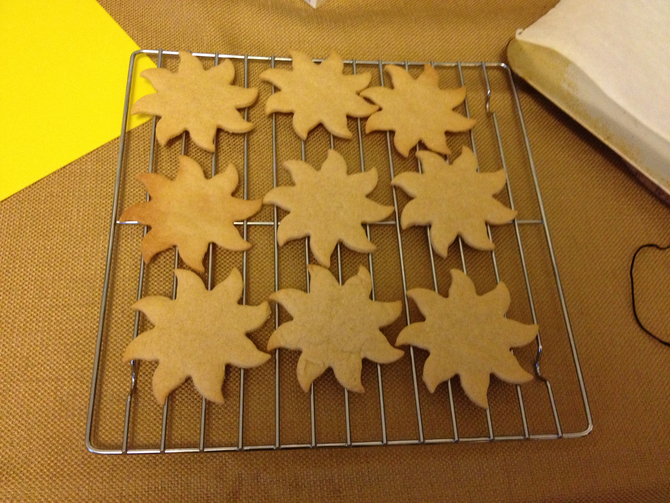 Too little dough will make seasonal snowflakey edges; it won't harm the cookie any. Pizzelles by the Egg; Chocolate Pizzelles, Eggnog Pizzelles, etc. I sometimes go up to 8 eggs or experiment with a couple, so I broke down the pizzelle recipe to a single egg. Peter is responsible for the eggnog variant. I tried a different chocolate pizzelle recipe from King Arthur Flour, but it was too liquidy for my iron. The two-toned pizzelles did work out, though. For real pizzelles use anise extract or oil. For chocolate pizzelles use vanilla extract and add 1 T. cocoa and 1 T. sugar. For almond pizzelles use 1 tsp. almond extract. For eggnog pizzelles use half the vanilla extract and add 1/4 tsp. nutmeg and 1/3 tsp. ground clove . For cinnamon pizzelles use 1 tsp. vanilla extract and 1 tsp. cinnamon. For other flavors use extract or oil. For gluten-free pizzelles, use buckwheat flour. To color pizzelles, use a few drops of food coloring. The baked color will be lighter than the dough color. For two-toned pizzelles, use half a scoop each of two different colors (or chocolate and uncolored). Put them side by side on the iron. 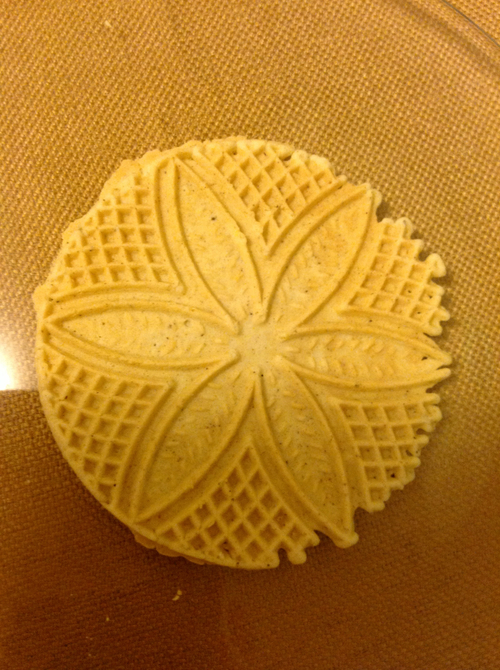 See full pizzelle recipe for directions. As I mentioned, I burned out my first pizzelle iron. On the day that it gasped its last gasp, I had already made the cookie dough, so I had to find something else to do with it. I got out my Italian cookbook and discovered that biscotti had almost the same ingredients, so I adjusted the flour and learned to make biscotti. I still have that cookbook, but the recipes I use now are from Recipezaar. 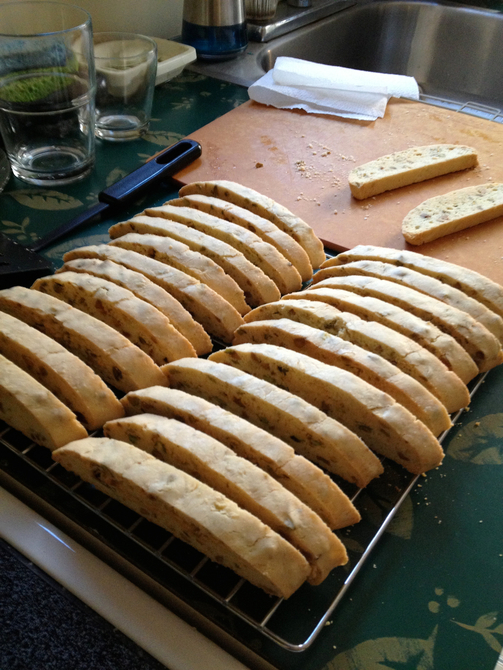 "Authentic" biscotti is half of Recipe #300513, by Summerlea; it uses anise seed and almonds. Preheat oven to 350°. Grind the anise seed with a mortar and pestle. Beat eggs, then add the oil, sugar and anise. Mix in the remaining ingredients. Lightly flour and roll the dough into one or two logs 2 inches in diameter. Place on a greased baking sheet or parchment paper. Bake 25 minutes. Remove from the oven, slice diagonally into 1/2 inch thick slices. Bake 10 minutes on sliced side, then flip and bake until slightly browned. To harden further, dry in the oven at 250°. 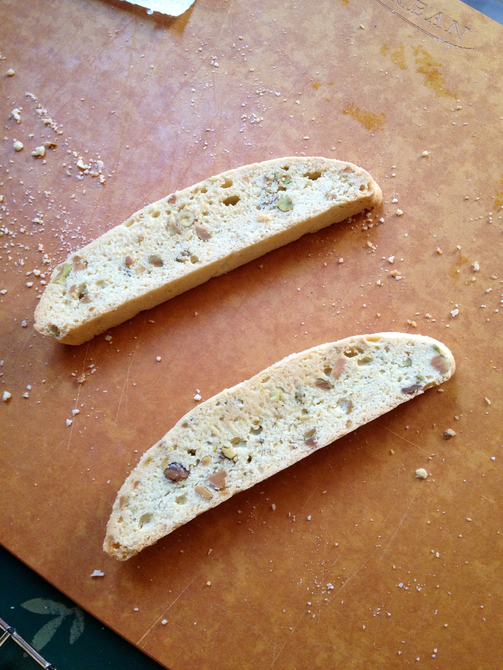 This recipe is for non-dairy pistachio biscotti. The yield depends on how you form and cut the logs. I've never gotten as few as the 18 the original recipe alleged. These are my friend Sarah's favorite of my rather small cookie repertoire. Based on Recipe #44360 on the now-defunct Recipezaar, which included butter, lemon zest, and an almond option. Heat oven to 325°. Combine flour and baking powder and set aside. 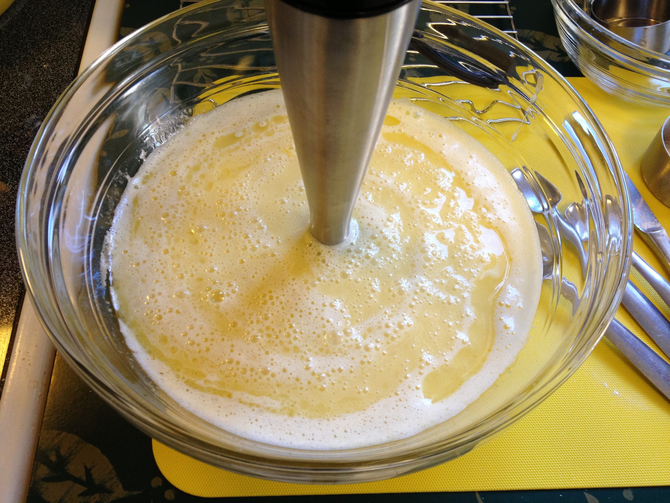 Whisk together eggs, sugar, oil, extracts, and salt in a large bowl. Stir in flour combination. Stir in nuts. 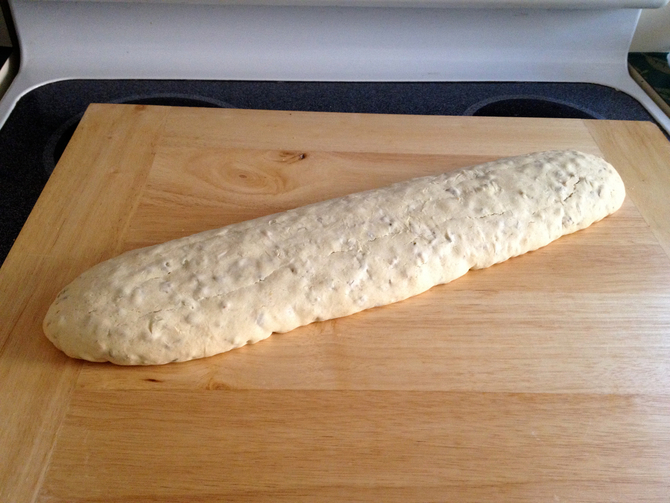 Form dough into one or two long narrow logs on parchment paper on an insulated cookie sheet. Bake 30 minutes or until toothpick comes out clean. Cool 15 minutes. Cut log(s) on an angle into 1/2 inch slices using a very sharp or serrated knife. 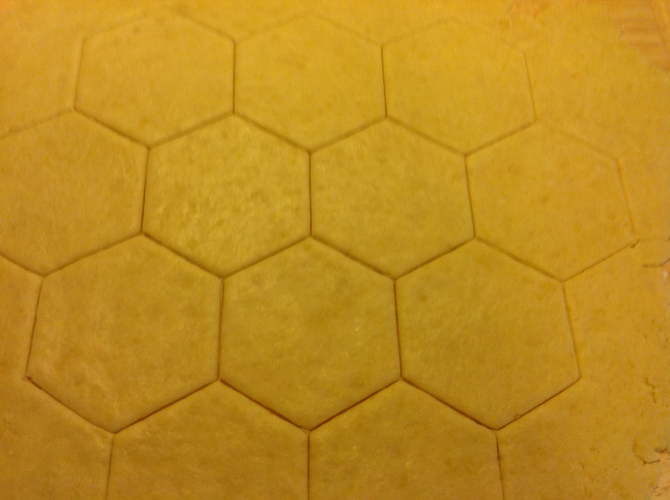 Lay slices flat on an uninsulated cookie sheet and bake 10-12 minutes or until golden on each side. (The recipe inconveniently makes about 1 1/4 toasting batches.) Cool on wire rack. 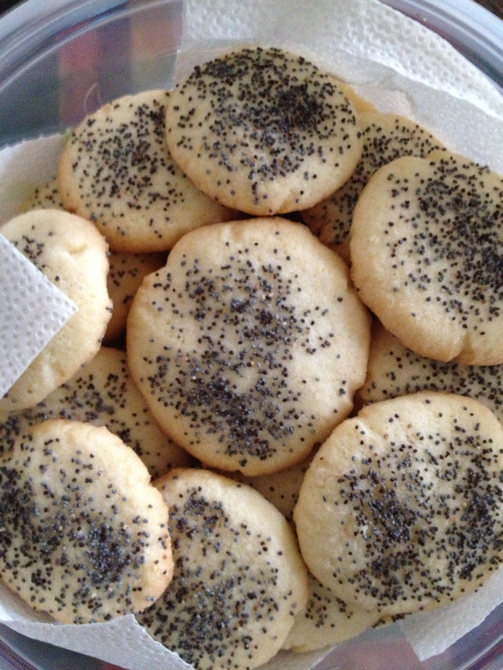 Anginetti are Italian lemon drop cookies; this is Recipe #104852 from Recipezaar. It uses lemon extract, which I like because I don't tend to have lemons around unless Peter has bought them for toddy. Cream sugar and shortening. Add eggs and lemon extract and beat well. Mix in flour, baking powder and salt. Scoop onto a greased cookie sheet, 2 inches apart. Bake 12-15 minutes. Cool on wire racks. To frost, mix frosting ingredients until smooth. Frost tops with a metal spatula. Allow frosting to dry before stacking. Cream together all but the last four ingredients. Add egg. Add baking soda with flour. Add chocolate chips. Bake 1 T. per cookie on a greased baking sheet at 350° for 12-14 minutes. Cool on a rack. These are non-dairy almond butter cookie-cutter cookies I made for a solstice/Armageddon party. I cut them out with a sun-shaped cookie cutter from Tags. I started with the Peanut Butter Cutouts recipe from The King Arthur Flour Cookie Companion because I meant to make peanut butter cookies, but my jar of peanut butter was crunchy and the almond butter was smooth. I had the non-dairy almond cream hanging around. I tried to make the Vanilla Glaze from the cookie book using almond cream as well, but it came out too runny. Beat together first seven ingredients (up to the egg). Beat in egg. Beat in cornstarch, half the flour, and half the cream. Mix in remaining cream and flour. Divide dough and refrigerate 1 hour. Preheat oven to 350 degrees. Roll dough out between two sheets of parchment paper to 1/4 to 1/8 inches thickness, depending on desired crunchiness. Cut out a dozen cookies and place on parchment paper on a cookie sheet. Bake 10 to 12 minutes. Cool on a rack. Repeat as necessary. 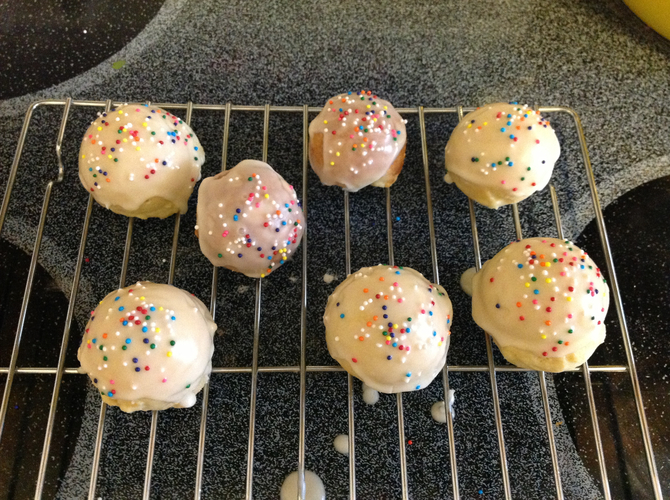 Taste for almondy goodness and frost with almond-extract flavored icing if needed. This is my classic rice flour cookie recipe that I've been making for years. 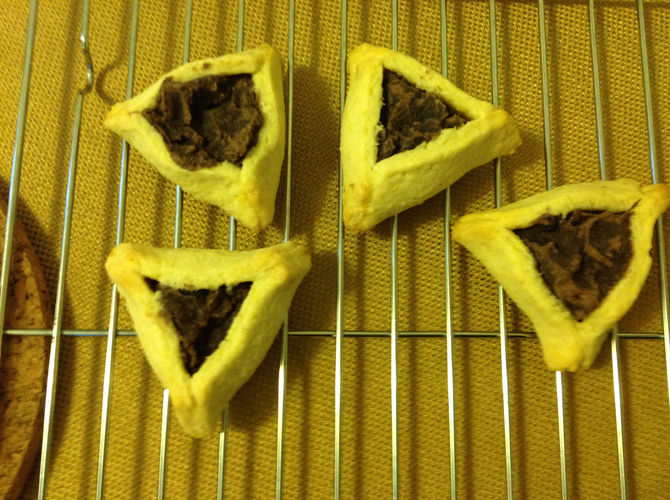 It's from Sephardic Cooking by Copeland Marks (p. 186). 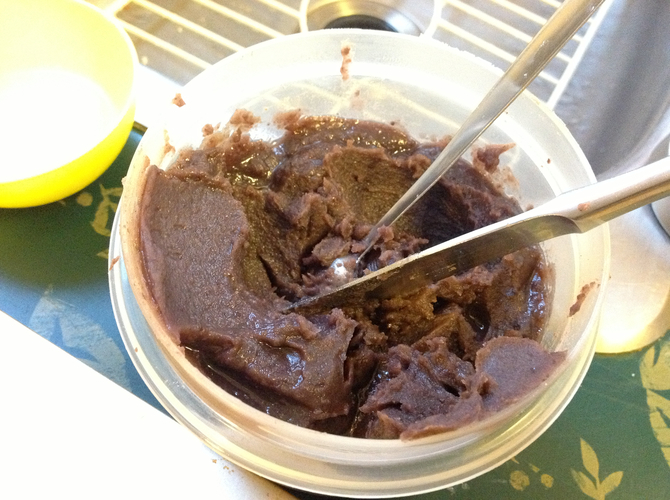 I also experimented with a Nan Berenji recipe in the New Food of Life cookbook, but that one failed. Cream butter and sugar. Mix in eggs and water. Add dry ingredients (except poppy seed). Roll 1 heaping tsp. at a time and press down onto greased cookie sheet. Sprinkle with poppy seed. Bake 20 minutes at 350°.